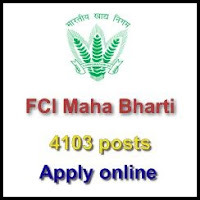 FCI 2019 Recruitment: Best Job Opportunity for degree holders in Food Corporation of India. Food Corporation of India has officially announced a recruitment notification to fill the posts of Junior Engineer (Civil/Electrical Mechanical, Assistant Grade – III, Steno Grade – II and Typist zone wise. Candidates who meet the eligibility criteria can apply through online from 23.02.2019 to 25 .03.2019. The online application form shall be available along with instructions on the official website. For more details please read the complete notification given below. Food Corporation of India has invited online applications to fill the various vacancies in different zones. Candidates can fill their application forms through online mode only. There is no other way to submit the application form. We have advised the candidates to read the instructions carefully to ensure that they are eligible or not. Degree/Diploma in Engineering with one year experience. Graduate with ‘O’ Level Qualification of DOEACC and speed of 40 w.p.m and 80 w.p.m in typing and shorthand respectively. 3. One year experience of translation from English to Hindi. Graduation or Equivalent with 30 W.P.M in Hindi Typing. Bachelor of Commerce from a recognized University. B.Sc in Agriculture/B.Tech/BE in Food/Food and Science Technology/Agriculture Engineering/Bio-Technology from a recognized University.